The best days of birdwatching always require a bit of co-operation from the fickle British weather, and as we headed towards Frampton Marsh RSPB last Friday (September 22), it briefly looked as though that co-operation wasn’t going to be forthcoming. Thick mist obscured the fields, and we wondered whether we’d see any of the many waders displaced from The Wash by the extremely high tide. But our fears were misplaced. Gaps appeared to reveal first the sun, then a flyover group of Golden Plovers, and as we got our things together in the car-park more and more of this fast-developing site emerged from the mist, along with a loose flock of around 50 Bird Watching readers, most of them intent on adding a few ticks to their #my200birdyear lists. Grey Plovers flew over, calling, a Cetti’s Warbler chattered away from some nearby scrub, and as we walked towards the sea wall, there was also the sound of Curlews somewhere in the distance, plus Redshanks sounding the alarm. On the scrapes beside the road, little flocks of Dunlin fed, interspersed with the odd Ruff or Greenshank, while around 15 Yellow Wagtails picked around the feet of cattle. By the time we reached the sea wall, the mist was gone for good, and we had wide-ranging views both back over the reserve, and out over the rapidly disappearing saltmarsh. Little Stints and Curlew Sandpipers were picked out from among the Dunlin below us, while a Wheatear perched on a fencepost and a Sparrowhawk dashed across, hoping to flush Meadow Pipits. 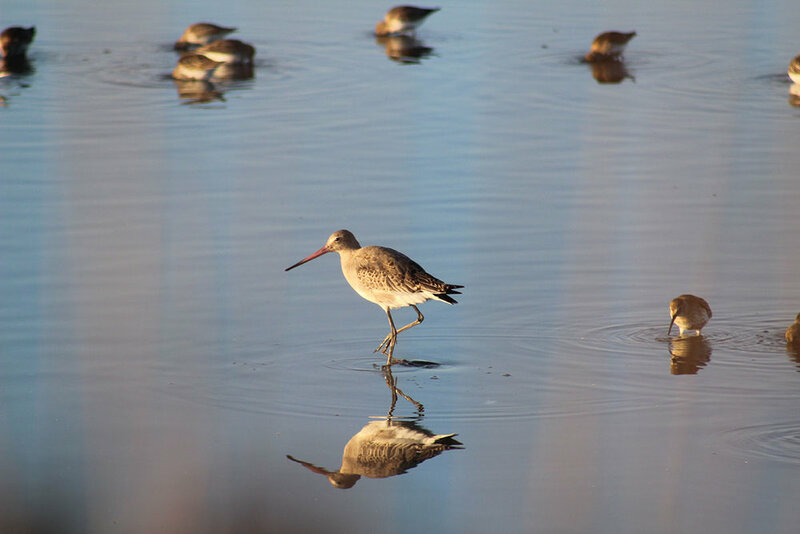 A little further away, a flock of 3,000-plus Black-tailed Godwits were visible, plus maybe half that many Wigeon, and some extended ‘grilling’ of the former produced a single Knot, while a small group of Spotted Redshanks flew over. So far, so good. 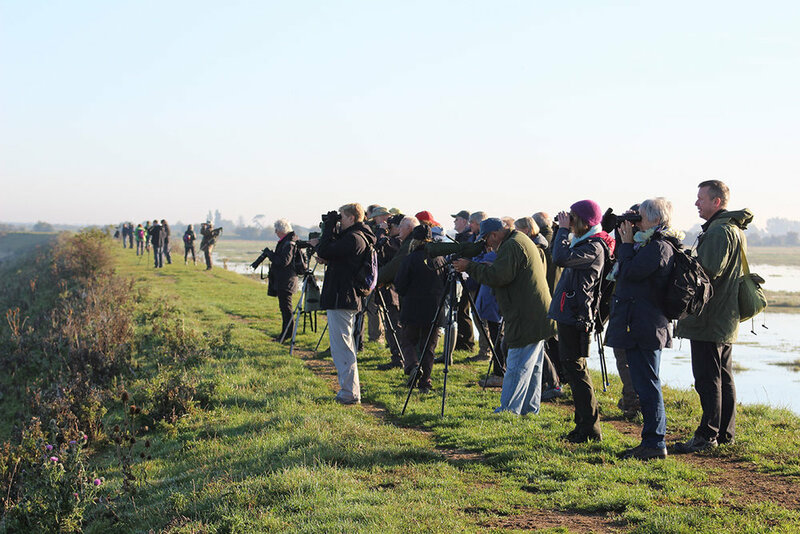 Pretty much everyone was adding ticks to their lists, but more importantly, they were enjoying the glorious birds in glorious sunshine, and getting a lot of useful tips from Frampton Marsh warden Toby Collett (@boywonderbirder), who gave a relaxed but hugely informative wader ID masterclass. Scope views of a Merlin on the ground on the far side of the reserve turned our attention to raptors, and we picked out Kestrels, Buzzards and Marsh Harriers at long range, plus a single Whooper Swan and a similarly solo Bar-tailed Godwit. Wood Sandpiper was another good tick for many, although it eluded some of us (including me – I’m not jealous, honest). Finally, we headed over to the Reservoir, a part of the reserve I’ve completely missed in the past, to look for the Red-necked Grebe that had been present for a couple of days. And sure enough, there it was, a juvenile resplendent with stripy cheek and throat, and rusty-red neck and upper breast. It was an active bird, and occasionally hard to pick out from the many Little Grebes also on the pool, but it kept us all watching for a good hour. So, we all headed homewards tired but with the satisfaction of having seen something new, whether for the year or for the life list (that Merlin on the ground was a first for me – I’ve only ever seen them perch on fenceposts previously).